In the culinary world, yeast has a wide variety of applications. For thousands of years, yeast has been used to produce carbonation, alcohol, leaven bread, and provide nutritional supplementation. Yeast is a single-celled organism with over 1,500 of known species. Saccharomyces cerevisiae is the species most widely used in food production. Yeasts that are used in food production prefer warm, moist growing environments with a slightly acidic pH. Through the process of fermentation, yeast converts sugars into carbon dioxide and alcohol. These two byproducts make yeast an extremely useful tool in food production. Carbon dioxide is what gives alcoholic beverages such as beer and champagne their characteristic bubbles and is also responsible for rising bread. As yeast begins to metabolize sugars in bread dough, the carbon dioxide gas is trapped within the gluten strands, creating bubbles and causing a leavening action. In beverages, the carbon dioxide is trapped within the liquid by the pressure of the sealed container. When the container is opened, the pressure is released and the carbon dioxide begins to release via a bubble. Alcohol, the other byproduct of yeast fermentation, is also produced during the bread making process but evaporates as the bread bakes. When making alcoholic beverages, yeast is allowed to ferment for a much longer period of time, causing it to produce more alcohol. Nutrition: Raw yeast is not recommended for consumption in any large quantity as it can proliferate within your body and have negative effects. Once pasteurized, yeast offers a host of nutritional benefits. Yeast is a good source of protein, B vitamins, and minerals. 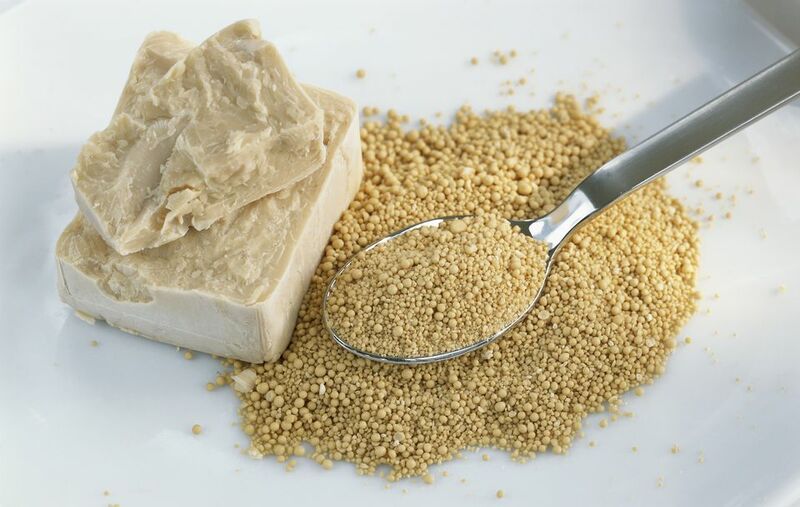 Yeast intended as a nutritional supplement is often sold as “nutritional yeast” or “yeast extract” and can be used as a flavoring, supplement, or other ways. Yeast extracts, such as Marmite, have a cult following due to their unique flavor and variety of uses.